SpeakerCraft® and Niles® speakers add a customized audio experience for residents while Furman® and Panamax® power conditioning solutions keep everything protected. The luxury apartment business is booming and the latest trend in this market is all about the amenities, as high-tech entertainment and control features are now driving sales and ratcheting up the competitive landscape for owners of these complexes who are increasingly targeting tech-centric homebuyers. When Jose Zapata of Affordable Alarm & Monitoring Inc. (AAMI) was hired by the owners of Altman Glenewinkle Construction to install the AV system for their latest South Florida luxury apartment complex, the focus of the project was clear – to install a state-of-the-art AV system on a tight budget that was easy to operate and completely customizable. Zapata knew the complex’s entertainment amenities were a high-priority in the project. Without hesitation, he chose to rely on the ELAN® Entertainment and Control System. Zapata needed a solution that provided these customized levels of control and could also handle controlling all the AV entertainment spread out over the entire complex, which covers around 10,000 square feet of space. The ability for management to address residents’ requests from an offsite location, or for maintenance people to quickly respond to a request using their iPhone onsite, such as the audio being too quiet in a particular location, was also high on the client’s list of “must-have” features that ELAN delivered. Zapata added that ELAN 4K Video over IP product line provided the perfect solution to another challenge the installation faced — needing multiple media sources distributed to multiple locations, spread out all over the complex. 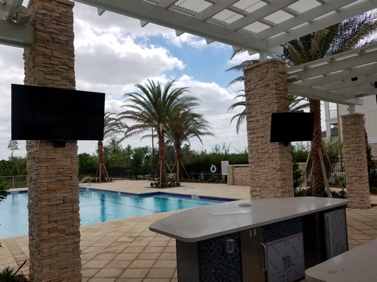 “The HDMI-over-IP transmitter, receiver and control modules incorporate built-in video scaling so we knew the video signal that was being delivered was going to be really high quality on every display screen throughout the complex,” he emphasized. A Furman® F1500-UPS supplies protection against power surges and battery backup in case of outages, vitally important in a state that leads the country in lightning strikes. “I know from past experience the F1500 will ensure years of trouble-free operation,” Zapata said. Two Panamax® power conditioners, the M4320-PRO and the VT4315-PRO, provide additional protection, plus BlueBOLT® remote energy management to monitor energy use, set alerts, program scheduled commands and initiate remote reboots. Zapata explained that the owners of Altman Glenewinkle Construction were extremely confident the amenities they were providing their residents would give them a distinct advantage in the luxury apartment game.